Texas A&M University System is one of the largest university systems in the United States. Coordinating, managing and archiving documentation is an intensive task for such an organization—yet the university system has found an efficient way by offering Laserfiche enterprise content management (ECM) as a shared service through its central IT office. 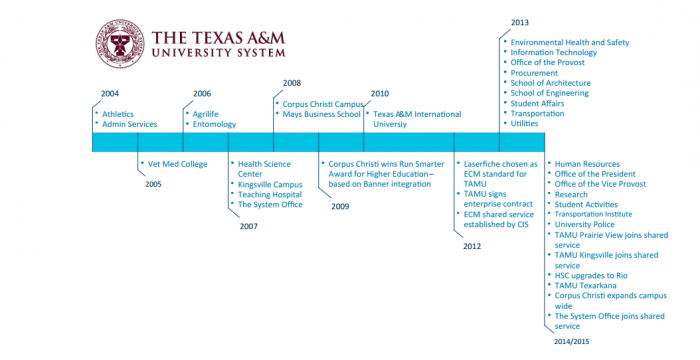 One of the university system’s members, Texas A&M AgriLife, adopted Laserfiche in 2008. Texas A&M Health Science Center (TAMHSC) followed shortly after. While the individual deployments cut paper-related costs, saved filing cabinet space and secured content in repositories, the university system as a whole was not leveraging those benefits across the entire institution. Texas A&M University System’s central IT office was determined to break down silos through implementing a shared services model, so that all schools and departments could efficiently leverage ECM knowledge and resources, and eliminate the need for individual departments or schools to purchase their own software. 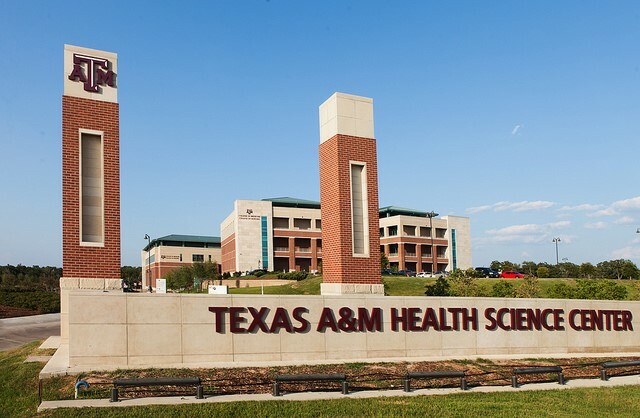 Texas A&M Health Science Center adopted Laserfiche ECM in 2008 to streamline contract management. While individual schools and departments within Texas A&M University System had implemented Laserfiche for various reasons (AgriLife sought secure storage for records after enduring a flood, fire, collapsed roof and hurricane; TAMHSC wanted to combat costly contract management inefficiencies and eliminate file cabinets), users experienced similar benefits: increased efficiency and accuracy, improved records management, reduced costs and business continuity. Texas A&M University System’s procurement office provides shared services so that schools and departments can share documents, file structures and workflows, building on each other’s efforts. Shared services also consolidate IT functions from several system members to one location, reducing costs and time spent on maintenance. To that end, in 2010 a committee selected Laserfiche as the preferred vendor for a new shared ECM system to avoid hardware and software purchases at the department level, reduce costs by eliminating redundant systems and make it easier to share data, file structures and workflows between schools and departments. Two other campus-wide communities in addition to central IT are intimately involved with the Laserfiche shared services offering: a steering committee of senior management representatives who evaluate and promote best practices and appropriate conventions for Laserfiche; and a user community of practice that provides input and training for the end-user community. Other customers of Laserfiche shared services include the Texas A&M University Office of the President, Prairie View A&M University and Texas A&M University – Kingsville. Laserfiche automatically classifies reports and their contents, facilitating easy file management and the ability to search through keywords to retrieve information. Account processing and purchase processing are faster and records management is more efficient and secure, allowing Texas A&M to adhere more closely to state compliance requirements and institutional procedures.